As a tech geek, I pay attention to technology that solves real problems. After all, technology is supposed to make our lives better, isn’t it? That’s why Goodtaps has a section of apps dedicated to a major problem for many of us: staying healthy and fit. We live in times that make staying healthy a challenge. Many of us lead busy and distracted lives, under constant pressure to get things done, which makes it difficult to stay fit and even harder to get in the shape. All the more reason why we should take advantage of any help we can get, including digital help in the form of apps. In today’s day and age of mobile devices and 24/7 online connectivity, we now have a new breed of fitness tools not available to us just a few years ago: fitness and health apps for iOS (iPhone, iPad, iPod Touch) and Android devices. Apps that help you train, track your progress, stick to your diet, or get inspiration and motivation when you need it most. If you are like most people, you already carry around a phone in your pocket or handbag every day. Not only do we have these devices on us at all times, we interact with them constantly throughout our day. This new found connectivity presents a huge opportunity for health and fitness information wherever we are, whenever we need it. We can make informed, healthy choices at a restaurant, watch a demo of a new exercise, get stats and track progress while working out thanks to mobile apps. With the right apps, you can download workouts for the gym or home designed by fitness professionals. You can learn how to properly perform exercises if you’re a beginner, or improve the efficiency of your workouts if you’re a fitness veteran. Try new exercises by watching video demos, design and schedule your own custom workout plan, analyze your progress and make adjustments, even practice yoga, all from your phone. Today’s apps provide everything you need to reach your fitness goals. Nutrition and diet apps can be your best friend when you’re alone. At the office wondering what you should eat for lunch, when out running errands and getting hungry, on business trips away from home. These can be times when you’re most vulnerable. When trying to keep your diet on track, apps can keep you focused on what you should be eating. There’s also a line of health gadgets called FitBit with apps that connect and sync with your mobile and desktop devices, allowing you to track weight, meals, physical activity and sleep for a complete picture of how daily choices affect your weight loss and overall health. 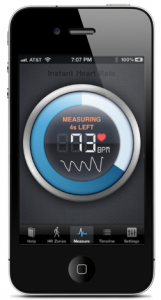 Your phone can even read and report your heart rate without any special attachments. Instant Heart Rate is an app that can measure your heart pulse by placing your index finger on your phone’s camera lens. In a few seconds you’ll see your heart rate real-time on the app’s screen. Knowing your heart rate while you exercise is important in maintaining the right zone for fat-burning cardio or staying within levels for other fitness objectives. Tracking your resting heart rate is a good indicator of overall health. But why spend $50 or more for a heart rate monitor when you have one built into your smartphone using the same technology? Instant Heart Rate can also save your heart rate data and export it for tracking or analysis on your desktop or laptop computer and integrates with some Fitbit and other peripheral health gadgets. Aside from the great apps you can download, your phone can be part of your overall support team, keeping you connected to family, friends or personal trainers to keep you motivated and progressing when away from home. Mobile devices can also keep you energized with your work-out music and inspired with motivational messages and stories. Busy? Can’t afford a gym membership or personal trainer? No support from friends or family? Lack of information to make healthy food choices? Not anymore. Some might say there really are no excuses to getting in shape these days! The modern age has presented new challenges in our daily lives, but it has also given us new tools we can leverage in the fight to stay healthy. Try downloading a few of the apps featured on our site onto your phone or tablet to find out how they can augment and support your health goals for 2013 and beyond.